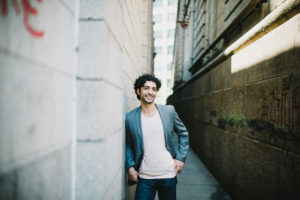 Noah Aronson and his band will perform a free concert that is open to the public at Congregation Shaare Emeth on Saturday, December 16, at 5:30 p.m. Noah is an energetic and soulful composer and performer whose unique style has propelled his music into communities across North America, Israel and Europe. Noah released his first solo Jewish album in May 2011, and the title song “Am I Awake” was a winner in the New Voices song competition at New CAJE in 2011. Noah’s album “Left Side of the Page,” released in 2013, has received widespread acclaim for its musical settings of poetic selections from the Mishkan Tefilah Prayer Book. Noah is currently serving as the Creative Director of Sacred Music NY, a nonprofit organization he helped to create that organizes concerts around New York City, bringing together spiritual musicians from diverse backgrounds to inspire interfaith dialogue and social change. Click here to learn more about the events that will take place during Noah’s visit and to RSVP.